We just finished a very full and fun weekend around here. The kids were off of school for a five day weekend, for grading and mid-term conferences. They had time to visit with friends, and catch up on sleep, as well as have some fun family time. We celebrated my Mother's birthday, my sister came up with my nieces and nephew, and we brought Great Grandma along as well. It is always nice for the kids to spend time with their cousins and Grandma's. My sister brought her new little Chihuahua along as well, such a cute and delightful little dog! In addition to the birthday fun, we spent one day driving to multiple errands, and were up and down some beautiful country roads. The day started out foggy- which I think is so beautiful, so I had to pull over and get a few pictures. I loved this red barn off in the distance, surrounded by morning fog. We also stopped along the way, at a farm with a nice pumpkin patch. The had big hay bales with really cute Harvest paintings, throughout the field. We found some nice varieties of pumpkins to add to our Fall decor. I love the dark orange, and green, and white varieties, if I can get another raised bed built, I would love to grow some of these different varieties next year. The farm had a great little store with Halloween goodies. Best of all they made Apple Cider donuts all day long, perfect along with fresh hot Apple Cider- the smell was amazing! The kids were glad to have a snack for our long day of driving around, and it was nice to get out in the fresh fall air and find some fun pumpkins. Here in our little backyard garden, our fall crop of Kale and Swiss Chard are doing great. I am not sure how well the Lettuce will do, I thought for sure I would still have warm enough weather to get a quick 30- day crop of lettuce in- but it is going much slower than expected- I found a great idea for an easy cold frame, so hubby may try building me one this week. Here's how tiny the lettuce still is. The Roses are beautiful this time of year too! I love stopping off at Country Farm Stands this time of year. 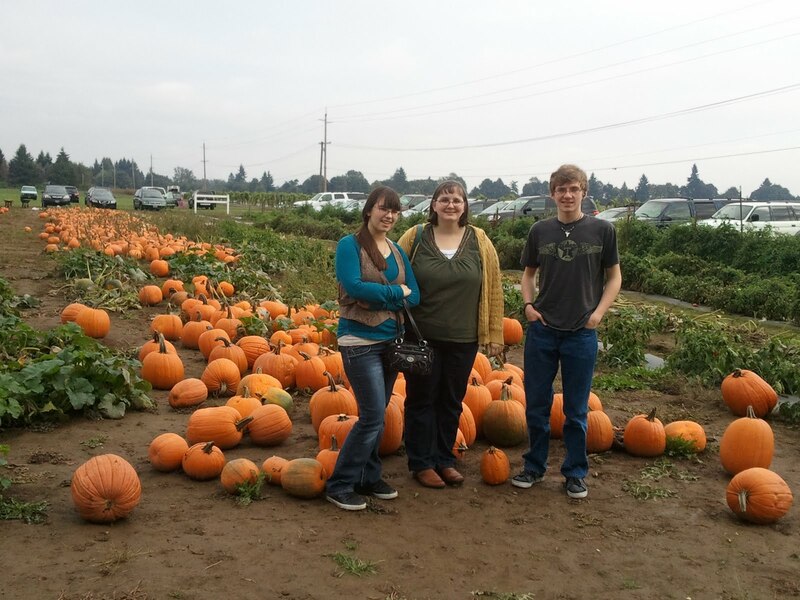 Have you been to a Pumpkin Patch yet, or a wonderful farm stand? It looks like a wonderful long weekend! We went to a pumpkin patch festival but I forgot my camera. Glad you got to visit with your family! Our annual trip to the apple orchard marks that fall is officially here for us. Those apple donuts look delicious! That picture of the barn in the fog is so beautiful. Love seeing the acres and acres of pumpkins. We just harvested ours this weekend. Looks like a nice outing! Great pictures! Thanks for commenting on my blog! I'm posting a trick or treat bag tutorial now. I've never seen so many pumpkins in one place! Love all the pumpkins...and apple cider...my favourite. Glad I stopped by.